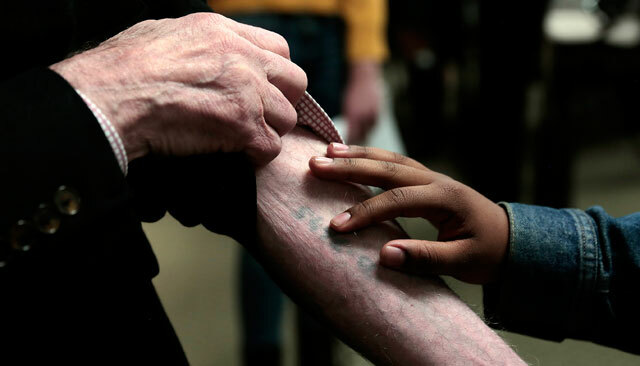 As a young teen, Henry and his mother survived deprivation in the Lodz Ghetto, thanks to the kindness of the Ghetto’s hangmen who gave him extra bread, only to be later separated in a life-or-death selection in the Birkenau extermination camp. 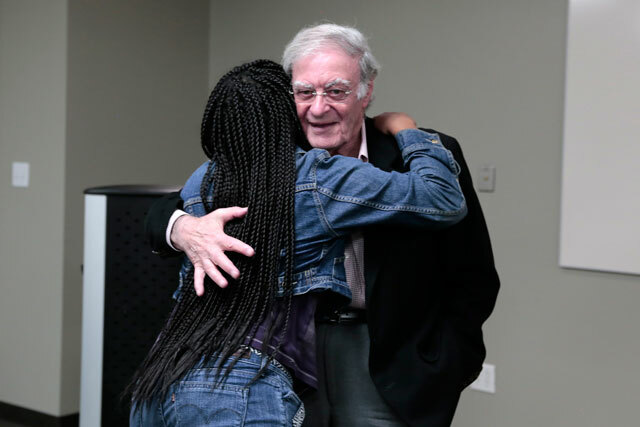 Shortly before his liberation from Buchenwald on April 11, 1945, Henry made it through a firing squad in Auschwitz, being strafed by an Allied fighter, and starvation. Learn more about Henry from his book: The Kindness of the Hangman! 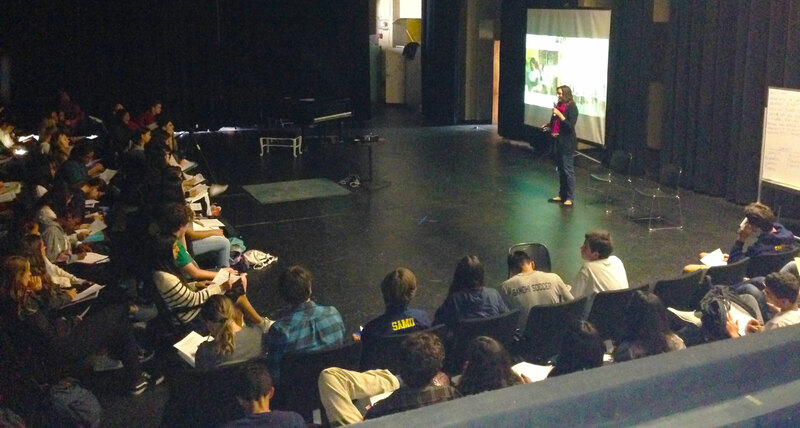 Rwanda Genocide expert, Amy Carnes, talks about her experiences in Rwanda. Photo by Kristin Ghazarians. 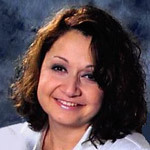 Jasmina Repak shares personal stories about her life during the Bosnian Civil War. 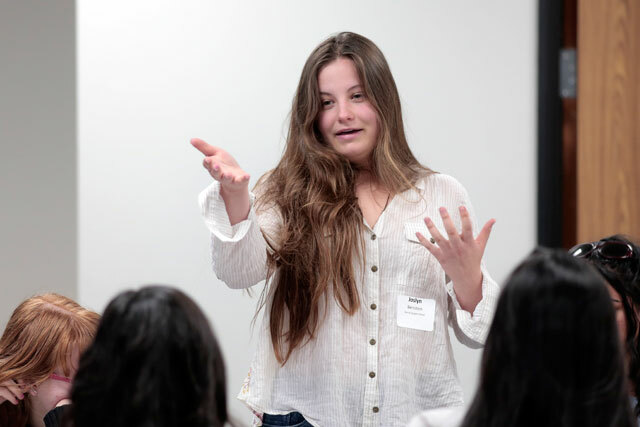 April 22, 2015: 250 students and teachers gathered at Carson High School to listen to STF alumna, Jasmina Repak, speak about her experiences as a teenager during the Bosnian Civil War. 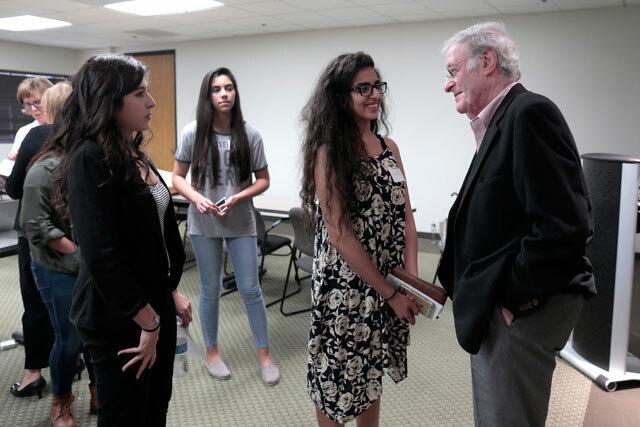 As a teenager, Jasmina learned about the genocide in Srebrenica and discussed the event with the Carson students. 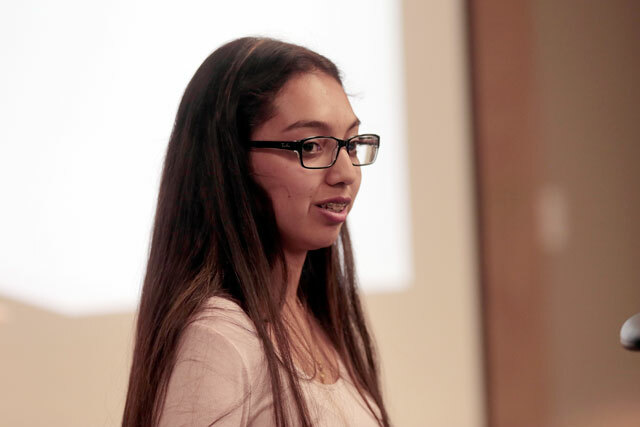 After her presentation, the audience watched “Sweet Dreams” and participated in a Q&A with Jasmina. Alepho Deng signs his autobiography for STF leaders. Photo by Jordan Abrams. 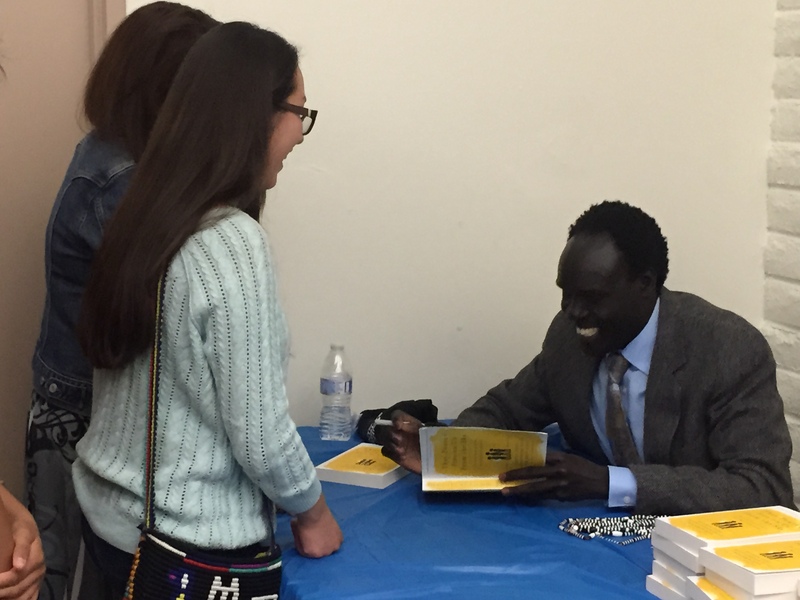 April 20, 2015: STF friend, Alepho Deng, spoke to 150 students at Valencia High School about his experiences as a Lost Boy of Sudan. 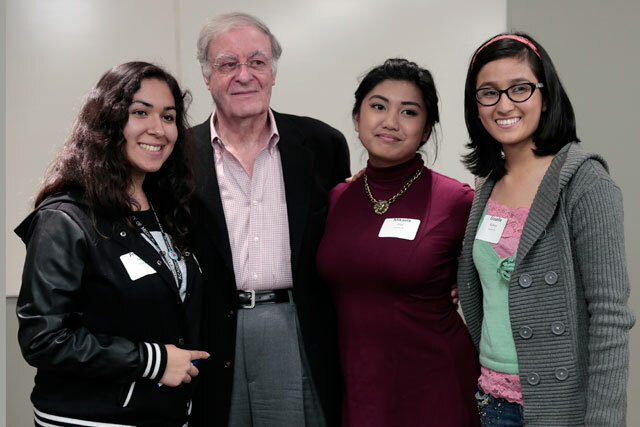 He then joined STF leaders in Santa Clarita Valley for dinner, before speaking at the Valencia City Library. More than 95 members of the community came to hear Alepho. 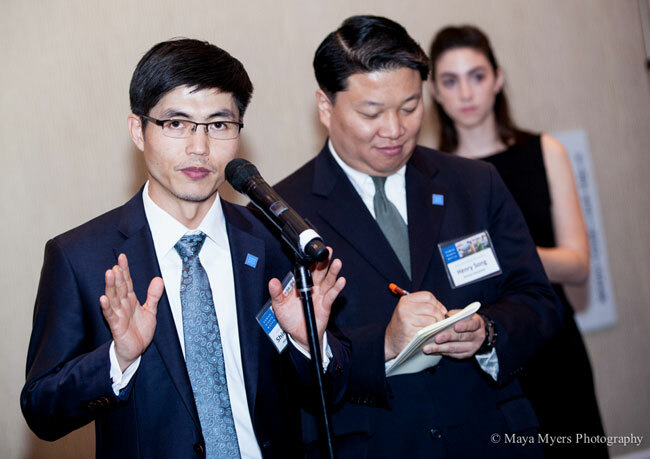 Audience members expressed their gratitude to STF for hosting the event and raising awareness of human rights issues. 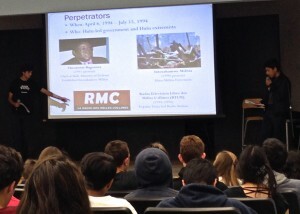 Pali STF Explains the history of the Rwandan Genocide. Photo by Kristin Ghazarians. 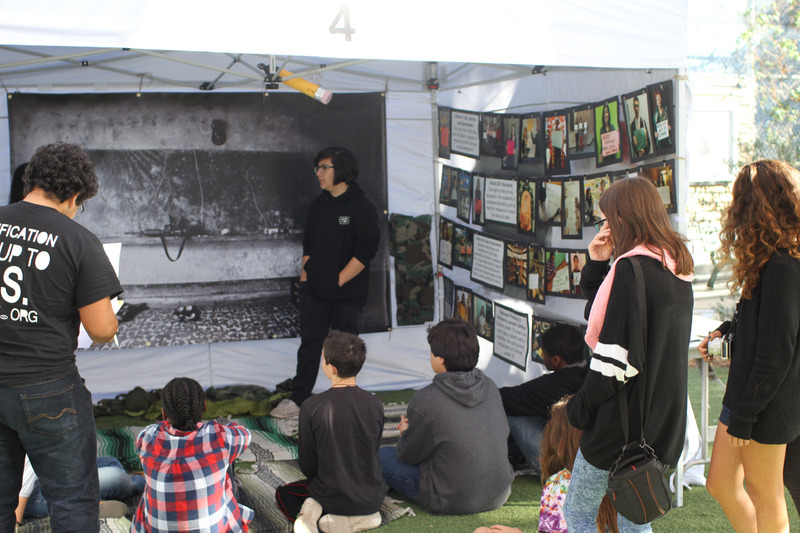 April 16, 2015: Reaching more than 400 students and teachers, the Palisades Charter High School STF chapter hosted an all day event to educate their campus about Genocide Awareness and Prevention Month. 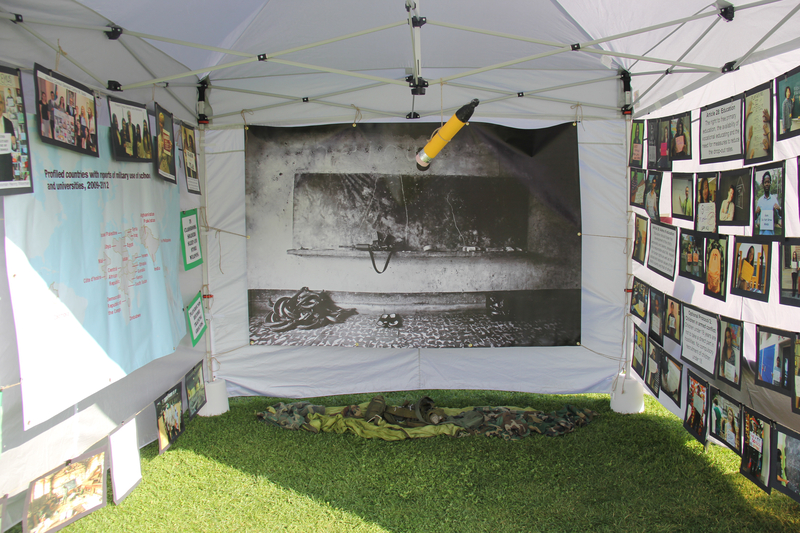 They explained the history of the Rwandan genocide and screened “Sweet Dreams.” They also had a gallery walk of information about other major genocides of the 20th and 21st centuries. Two to three thousand homeless children walk the streets of Chicago every night. 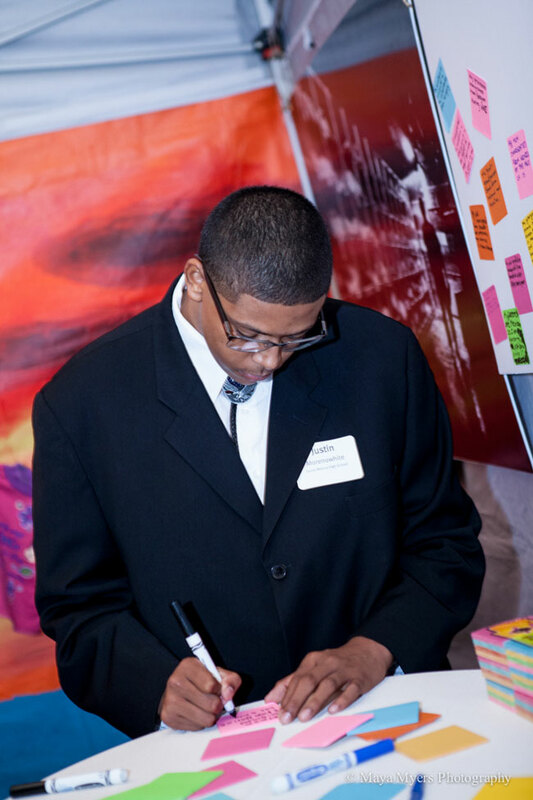 The Homestretch follows three homeless teens as they fight to stay in school, graduate, and build a future. Through haunting images, intimate scenes, and first-person narratives, Kasey, Anthony and Roque take the audience on their journeys of struggle and triumph. 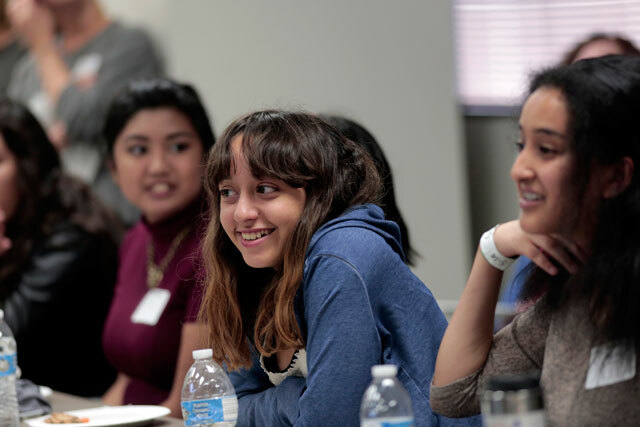 As their stories unfold, the film successfully exposes larger policy issues of juvenile justice, immigration, foster care, and LGBTQIA rights. 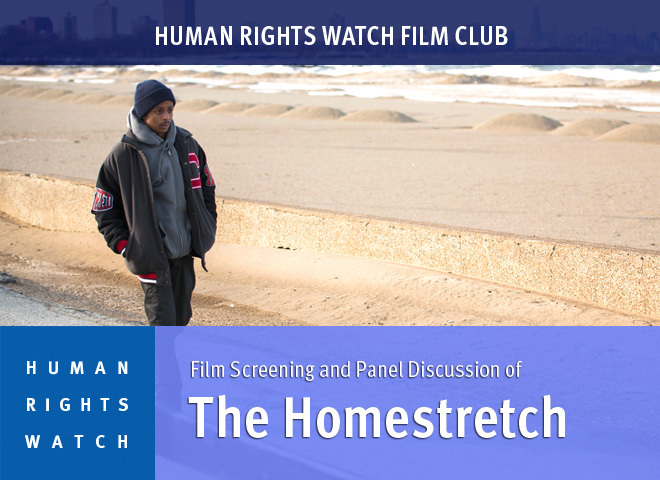 Join us after the movie with The Homestretch Director Anne de Mare and Human Rights Watch LGBT Director Graeme Reid, for a discussion moderated by Melissa Schoonmaker from the Los Angeles County Office of Education. 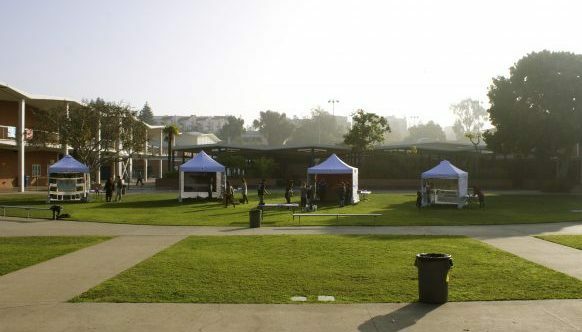 We will examine the situation of homeless youth in Los Angeles and Chicago, and explore what Human Rights Watch does to protect LGBT youth around the world. FREE Club members explain the conflict in Darfur for Genocide Awareness and Prevention Month. 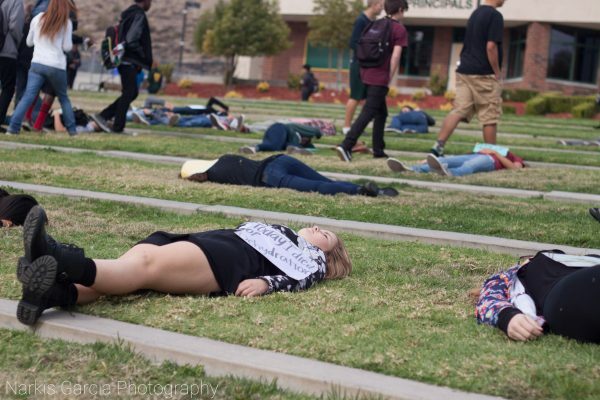 Students at New Roads “die” to honor the victims and survivors of genocide. Photo by Kristin Ghazarians. April 8, 2015: With the help of 60 students, the New Roads STF Chapter hosted a “die-in” to honor the victims and survivors of genocide. 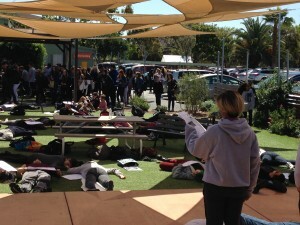 Students “died” in the main lunch area for 10 minutes as the entire high school walked past. Armed with signs and audience attention, speakers read facts from the Armenian, Holocaust, Cambodian, Bosnian, Rwandan and Darfur genocides. 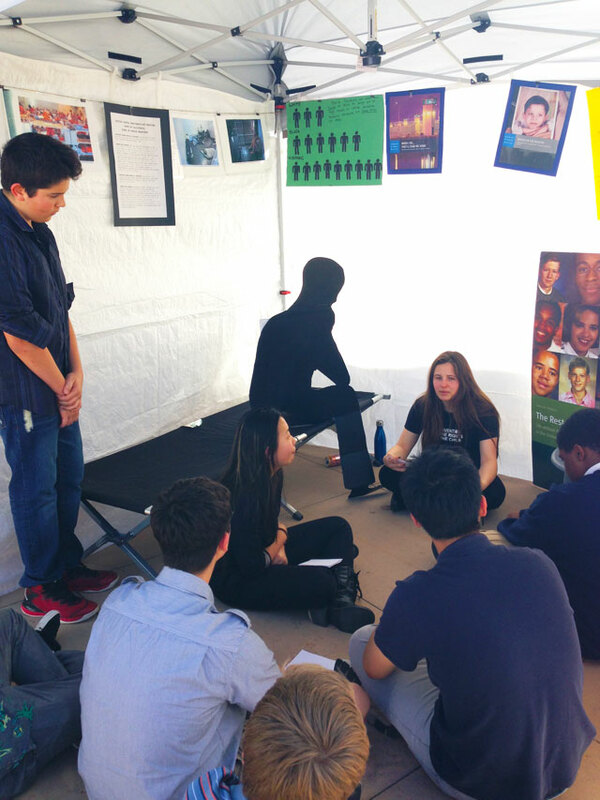 Prior to the “die-in,” STFers presented Genocide Awareness and Prevention Month at an all school meeting. 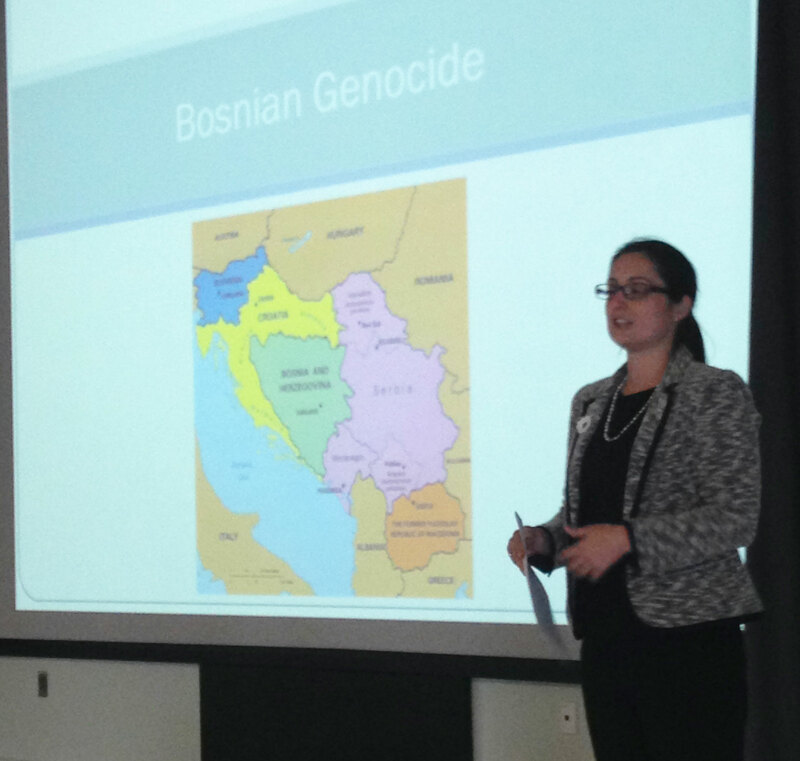 Left: Jasmina Repak Zuljevic describes her experience in Bosnia during the genocide. 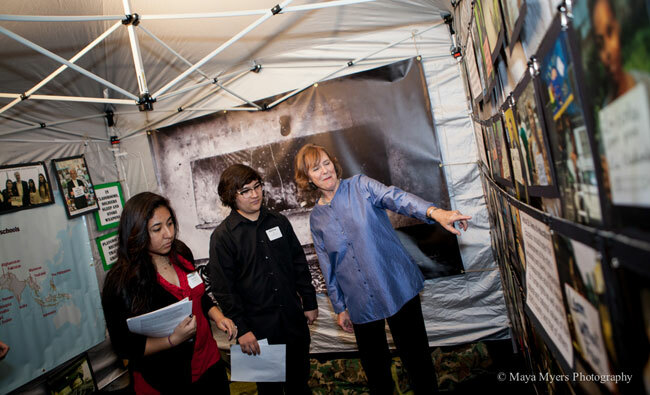 Right: STFers examine their knowledge about 20th and 21st Century genocides. Photos by Shaila Hernandez. 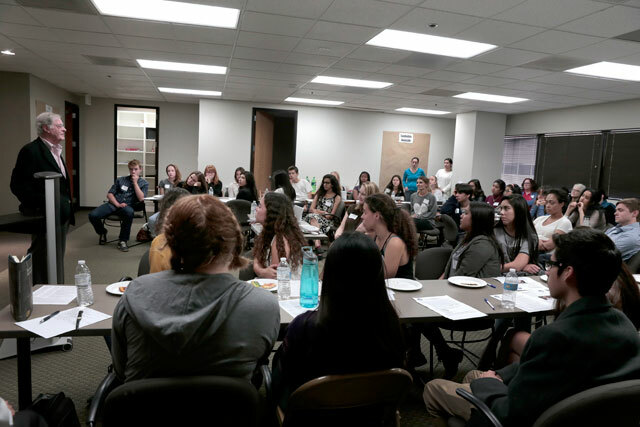 February 17, 2015: Student leaders and teacher advisors gathered at the STF Winter Leadership workshop to review the successful Children’s Rights Camps and launch the Genocide Awareness and Prevention efforts for April. 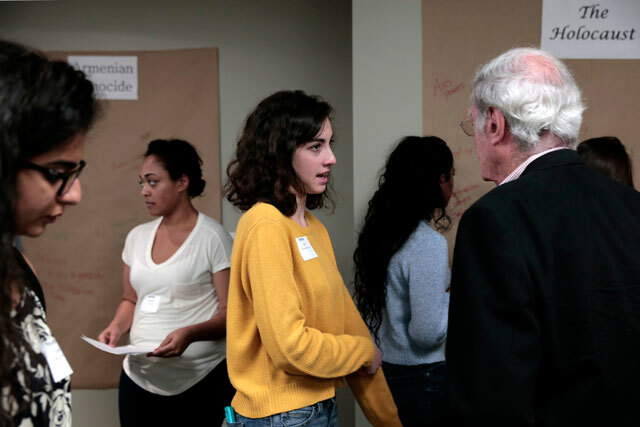 Students walked a 20th and 21st Century gallery of genocide and shared their knowledge and questions about: Armenia, the Holocaust, Cambodia, Bosnia, Rwanda and Darfur. To personalize our genocide research, Jasmina Repak Zuljevic, STF co-founder, related her experience as a teenager in Bosnia when the genocide broke out in 1992. 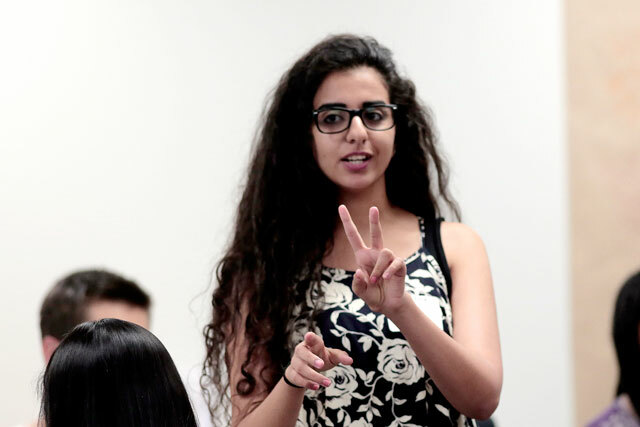 Jasmina showed her personal photos and explained the path her family took to reach safety in the United States. 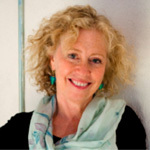 Lisa Fruchtman, producer and director of Sweet Dreams, joined the workshop via Skype, to discuss her film about Rwanda rebuilding after the 100-day genocide in 1994. Sweet Dreams will be a centerpiece of STF’s Genocide Awareness and Prevention month in April. 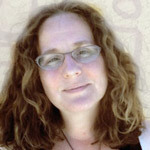 Lisa will be available to Skype for a few of STF’s April screenings, when possible. STFers welcome participants to the Children’s Rights Camp. Photo by Mollie Isaacs. 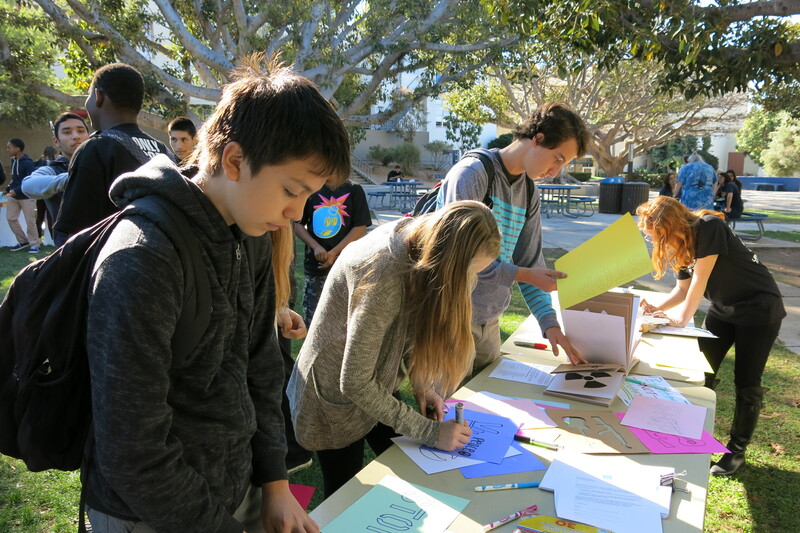 February 11, 2015: Oakwood STF hosted their Children’s Rights Camp event as part of their school’s Diversity Week dedicated to human rights. Educating more than 300 4th-12th grade students, teachers and administrators, the three-tent camp raised awareness about the Convention on the Rights of the Child, military use of schools and child migrants. 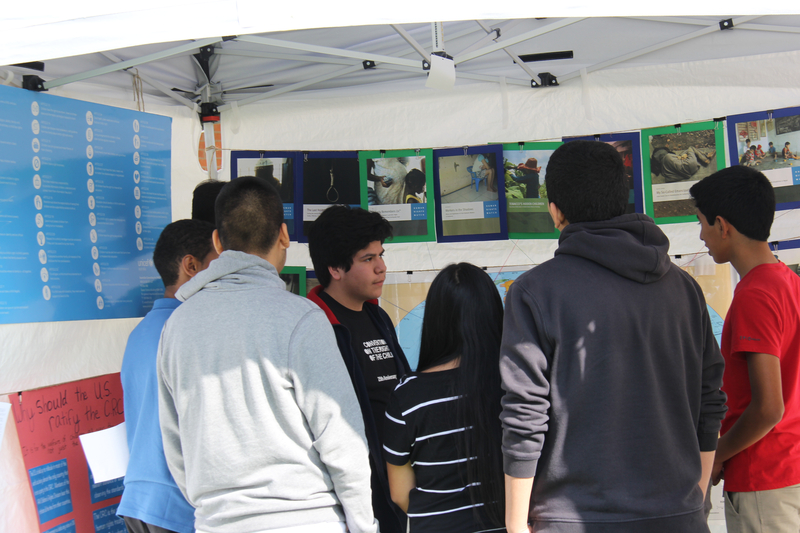 Students learn about juvenile offender, Edel Gonzalez, in the Juvenile Justice tent. February 5, 2015: The Sierra Canyon STF chapter, the FREE Club, invited more than 200 students and teachers to learn about the Convention on the Rights of the Child (CRC), Child Migrants, EMUS and Juvenile Justice issues at their Children’s Rights Camp. 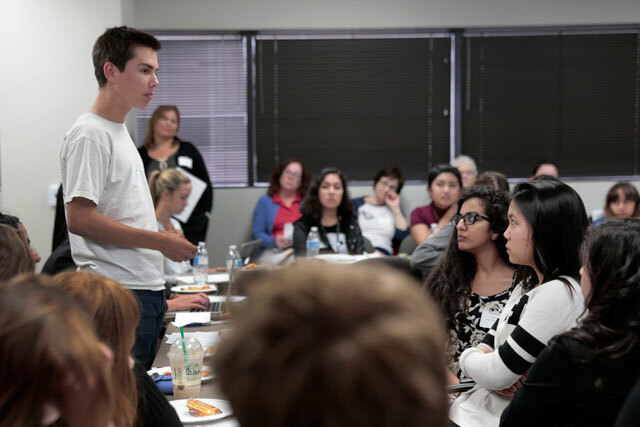 In a meaningful show of support, students wrote 150 letters to California Governor Brown in support of Edel Gonzalez, the first person originally sentenced to Juvenile Life Without Parole to be given a parole-eligible sentence under SB260. 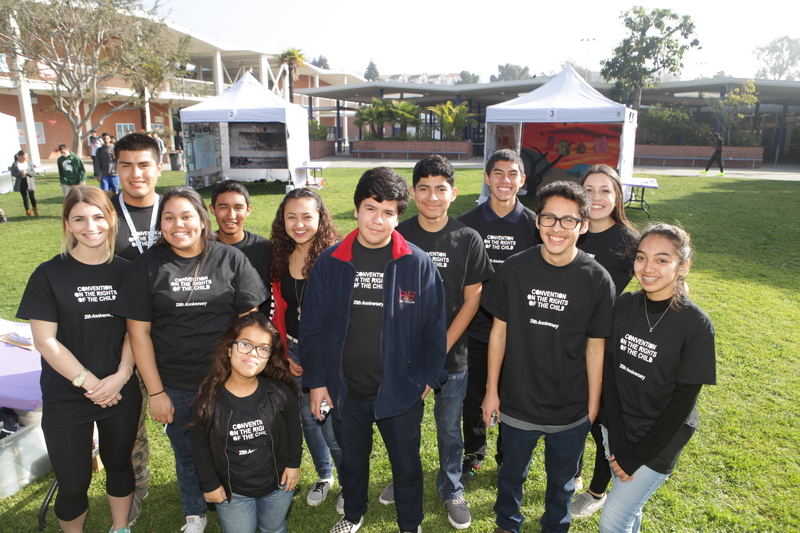 Thank you Sierra Canyon STF for such a strong effort to educate your campus! 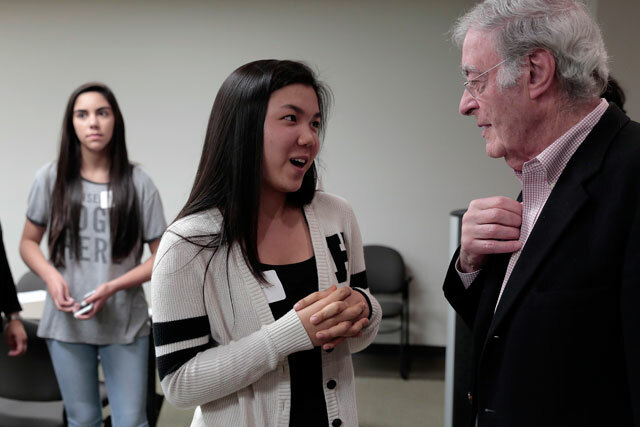 STF leaders speak at New Roads faculty workshop about significance of HRE to their education. 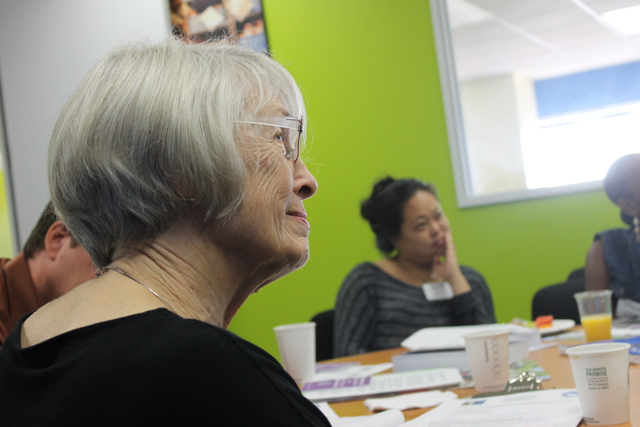 February 3, 2015: New Roads School invited human rights education (HRE) expert, Nancy Flowers, to discuss incorporating more human rights into their curriculum at a half-day workshop. 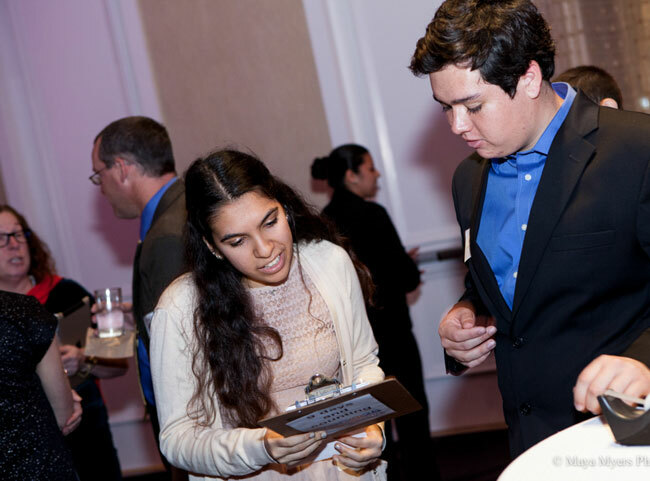 STF leaders Matthew An and Jessica Martinez spoke to the assembled faculty at the STF co-sponsored event, explaining why HRE is so important from the student perspective. 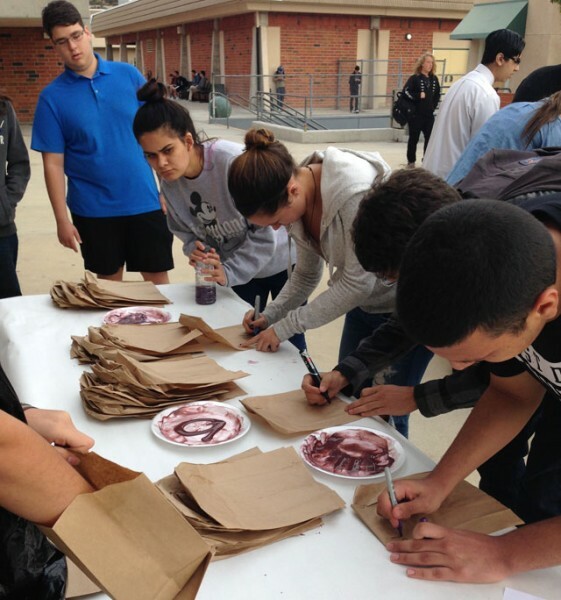 Canyon and Pali Camps Reach 1,000 Students! 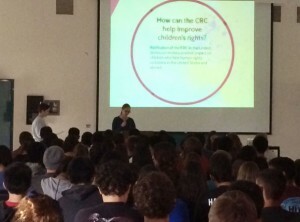 January 20 and 21, 2015: Hosting back-to-back events, Canyon and Pali High Schools educated 1,000 participants at their Children’s Rights Camps. 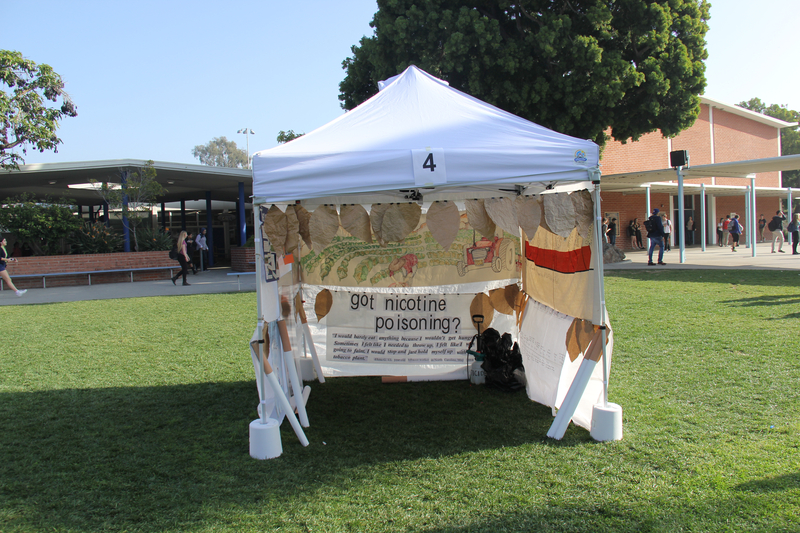 Taking a more personal spin on advocacy, Canyon students wrote their hand prints and messages of solidarity to the youth tobacco workers associated with NC FIELD, advocates for farmworkers and their families in North Carolina. 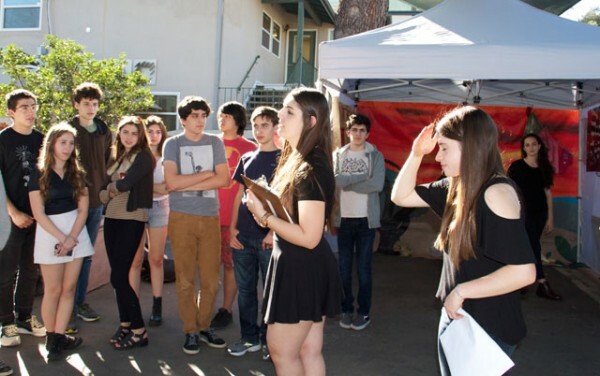 Congratulations to Canyon and Pali STF members for such productive Children’s Rights Camps! 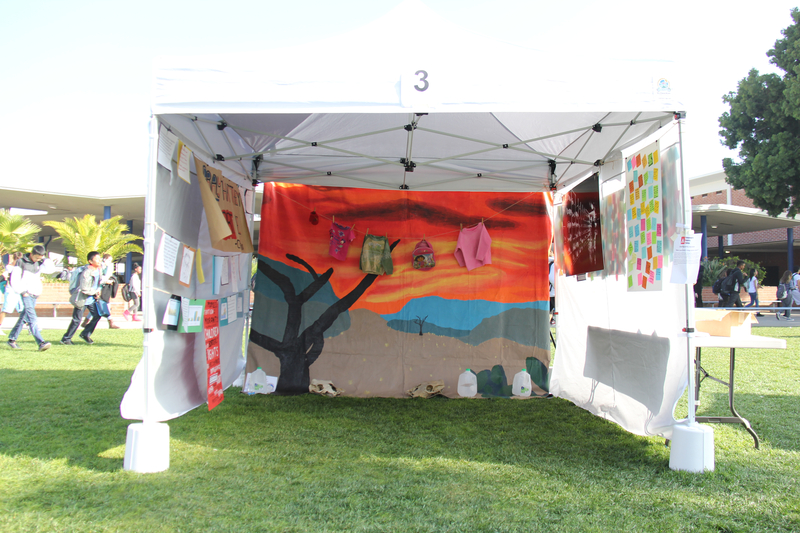 Canyon camp participants send messages of support to the youth of NC FIELD. Photo by Kristin Ghazarians. HRW Sends in the E-Team on January 30! 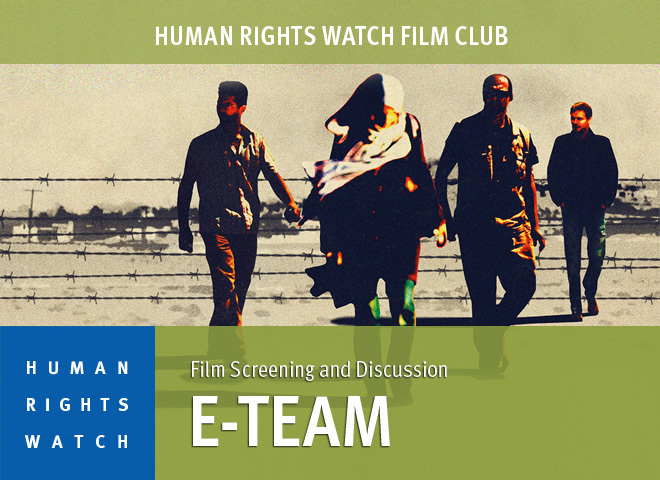 When atrocities are committed in countries held hostage by ruthless dictators, Human Rights Watch sends in the E-Team (Emergencies Team), a collection of fiercely intelligent individuals who document war crimes and report them to the world. Within this volatile climate, award-winning filmmakers Ross Kauffman and Katy Chevigny take us to the front lines in Syria and Libya, where shrapnel, bullet holes, and unmarked graves provide mounting evidence of atrocities by government forces. 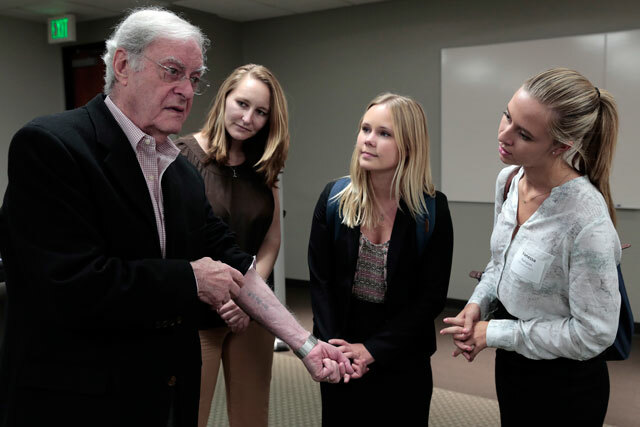 The crimes are rampant, random, and often unreported—making the E-Team’s effort to get information out of the country and into the hands of media outlets, policy makers, and international tribunals even more necessary. Cinematography Award US Documentary, Sundance Film Festival 2014. 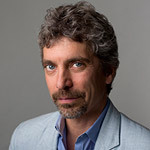 Join us before the film for a meet and greet with Peter Bouckaert, Emergencies Director for Human Rights Watch. 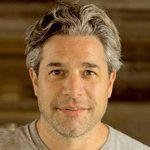 After the film, Peter will join in the discussion with E-Team co-director,Ross Kauffman. 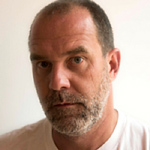 Ross is an award winning documentarian whose credits include the Academy Award Winning Documentary Feature Born Into Brothels: Calcutta’s Red Light Kids. 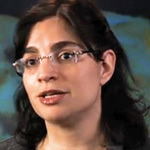 UCLA Law Professor Asli Ü. Bâli will be moderating our panel. 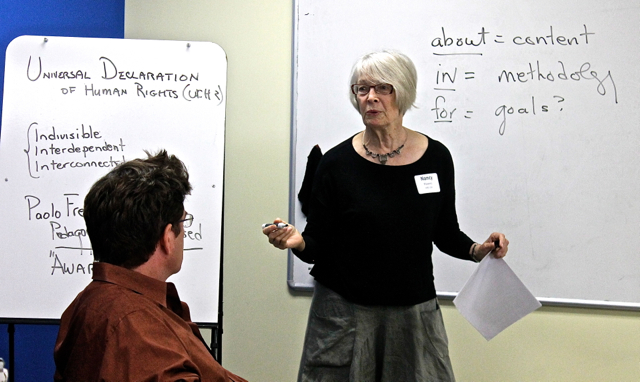 She teaches Public International Law, International Human Rights and Laws of War. 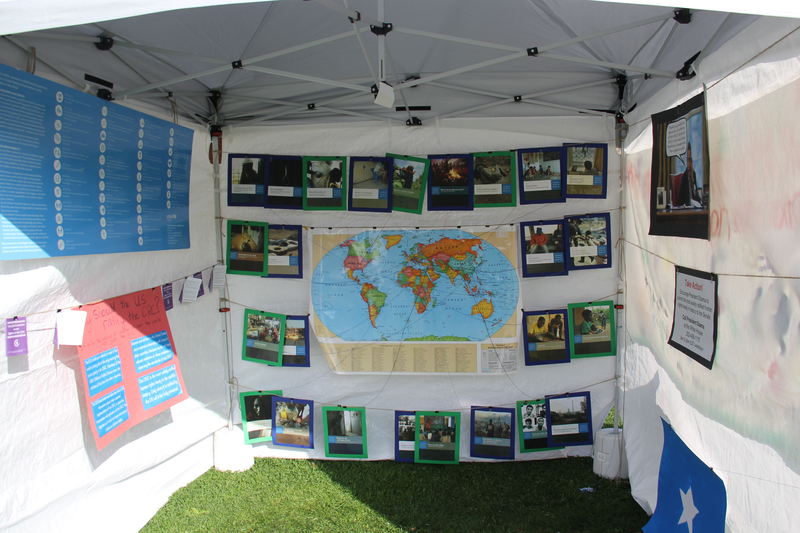 Proceeds from this event will support the work of Human Rights Watch around the world. Valencia High School learns about the Convention on the Rights of the Child. Photo by Younus Albojermi. 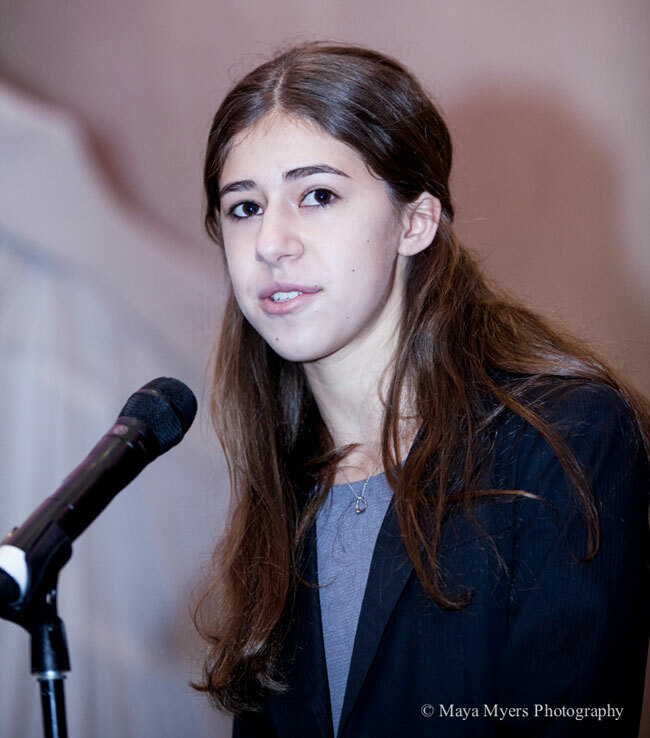 December 10, 2014: Valencia STF hosted a special school assembly to commemorate Human Rights Day in collaboration with the UNICEF and Help the Children clubs. 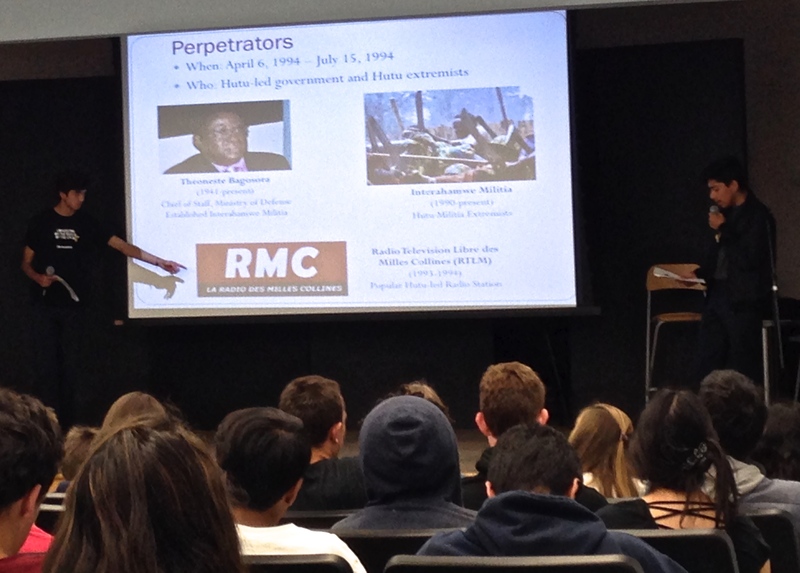 Students and teachers learned about the importance of U.S. ratification of the Convention on the Rights of the Child, child soldiers, child marriage, child farmworkers and the right to education. 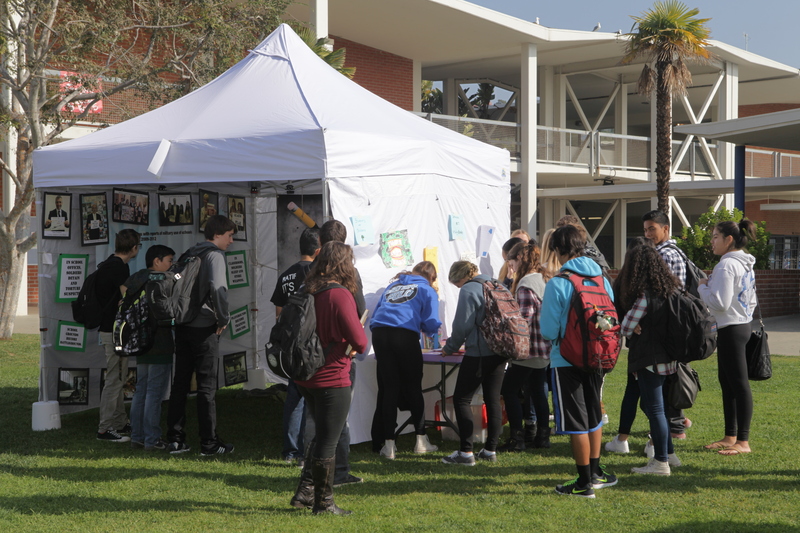 After the assembly, many interested students remained to ask STF questions about the topics discussed, the aims of the chapter, and information about the Children’s Rights Camp coming to Valencia High School in the spring. 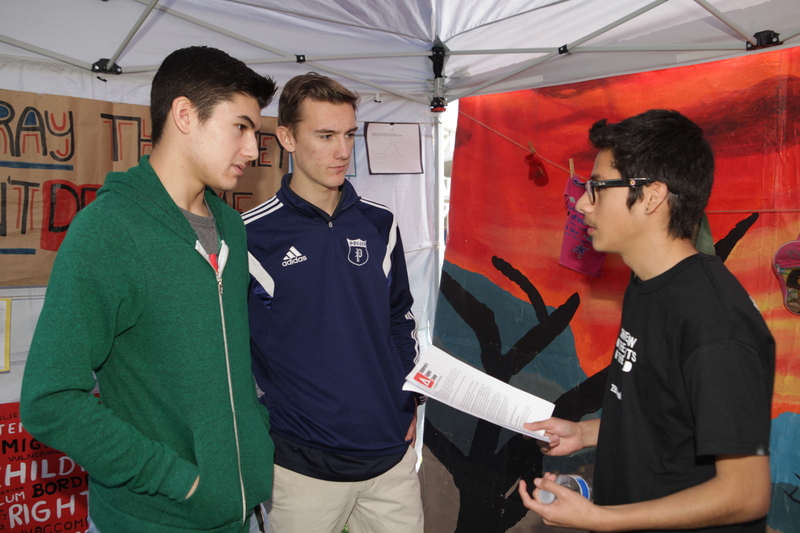 Students learn about the EMUS Campaign. 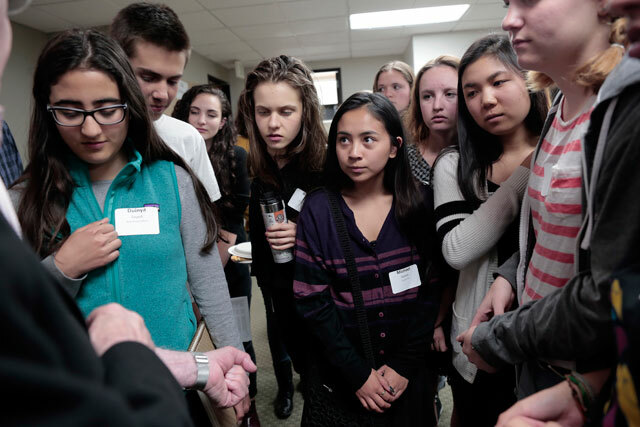 December 9, 2014: More than 250 students, teachers and school administrators attended the New Roads’ Children’s Rights Camp to celebrate human rights. 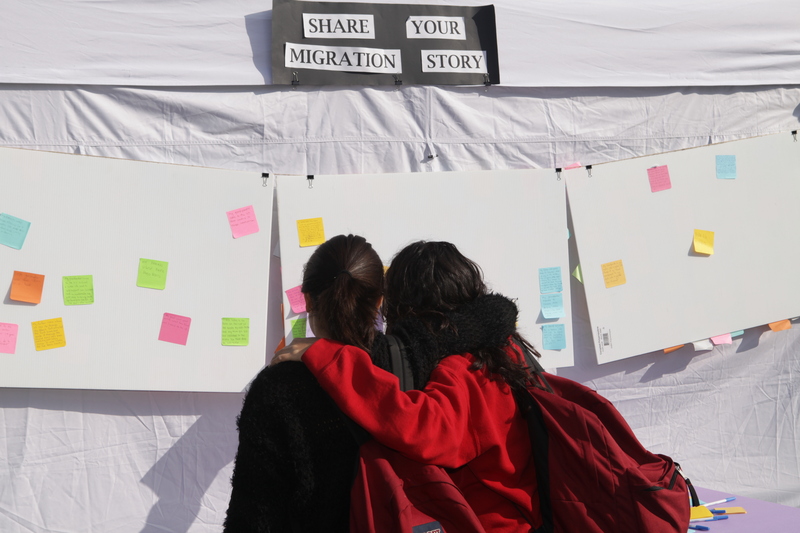 STFers asked participants to sign online petitions, call the White House, create EMUS slogans and share their family’s migration stories to promote discussion of the children’s rights violations presented in the camp. 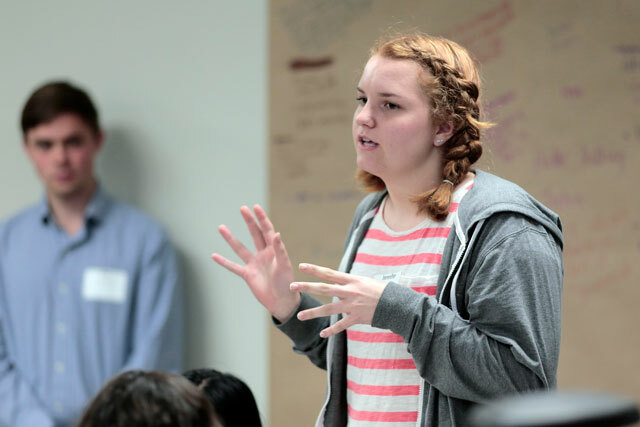 “Teachers and administrators have said STFers are leaders on our campus. You are the embodiment of our social justice mission. Congratulations!” said Sean Brookes, New Roads STF Teacher Advisor. SAMOHI students take action for the EMUS campaign. Photo by Coralie Hentsch. 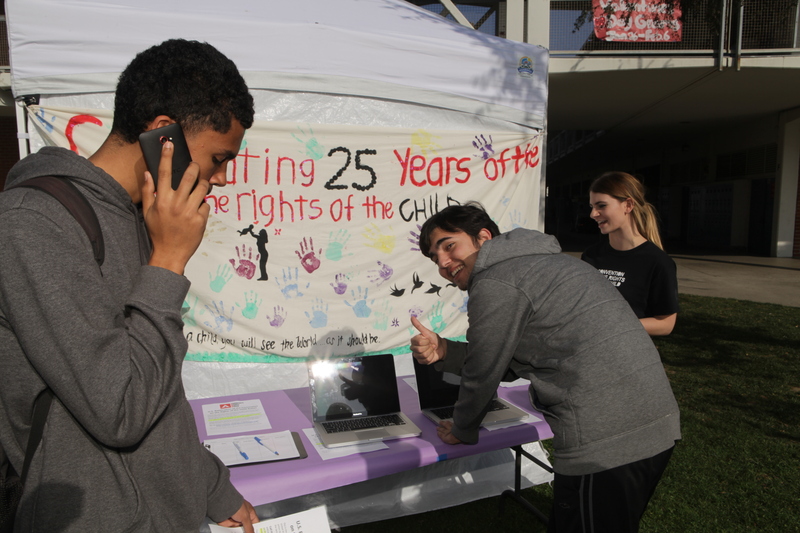 November 21 and 25, 2014: Santa Monica and Wildwood STF Chapters hosted the first traveling Children’s Rights Camps in honor of the 25th anniversary of the Convention on the Rights of the Child (CRC). 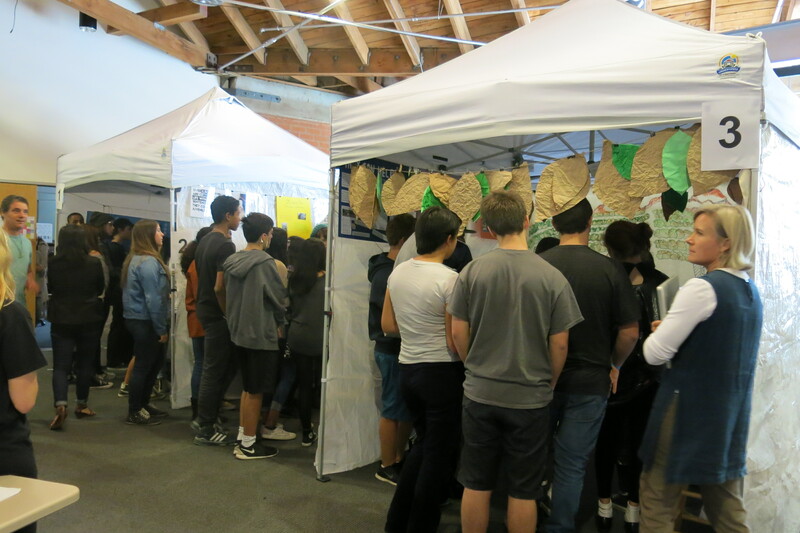 More than 550 6-12th graders learned about the need for US ratification of the CRC, military use of schools, child migrants, child tobacco workers and juvenile justice in California. 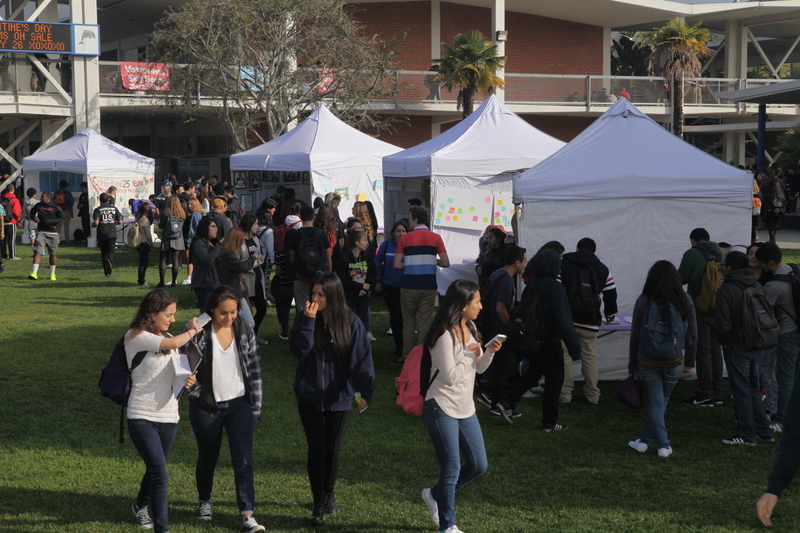 Students took action for children in the US and abroad, and shared personal connections to each theme. 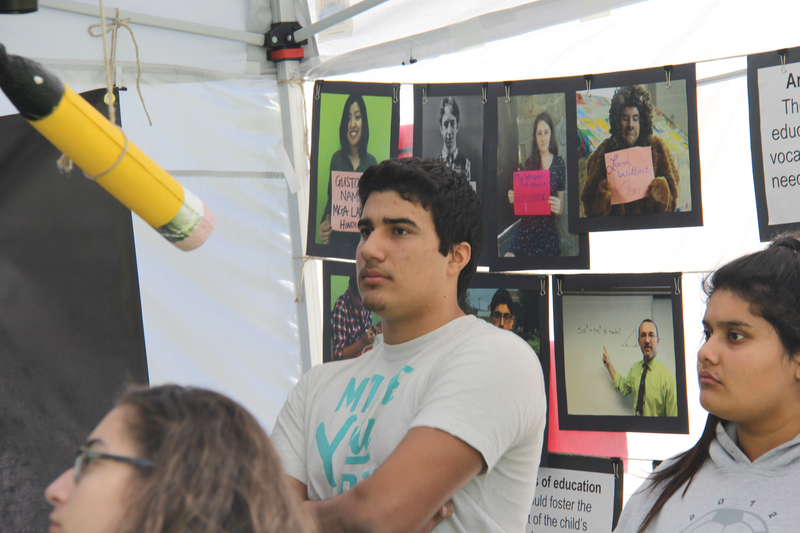 The Children’s Rights Camp will travel to Los Angeles and Santa Clarita Valley schools through February 2015. Wildwood students explore the camp. Photo by Coralie Hentsch. Canyon HS students “die” for children’s rights. Photo by Anthony Garcia. November 20, 2014: The Santa Clarita Valley STF chapters commemorated the 25th anniversary of the Convention on the Rights of the Child (CRC) by staging “die-ins” at Canyon High School and Academy of the Canyons. In a symbolic gesture to raise awareness among their peers, STFers “died” from variety of causes linked to human rights abuses faced by children or because the rights of children are not fully protected. Golden Valley STF displayed death notices in their library and common area. 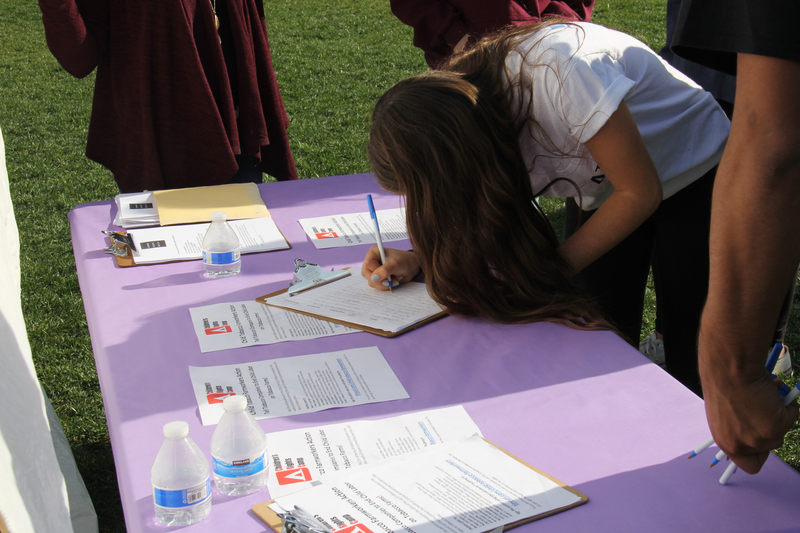 AOC encourages students to sign the CRC online petition. Photo by Younus Albojermi. 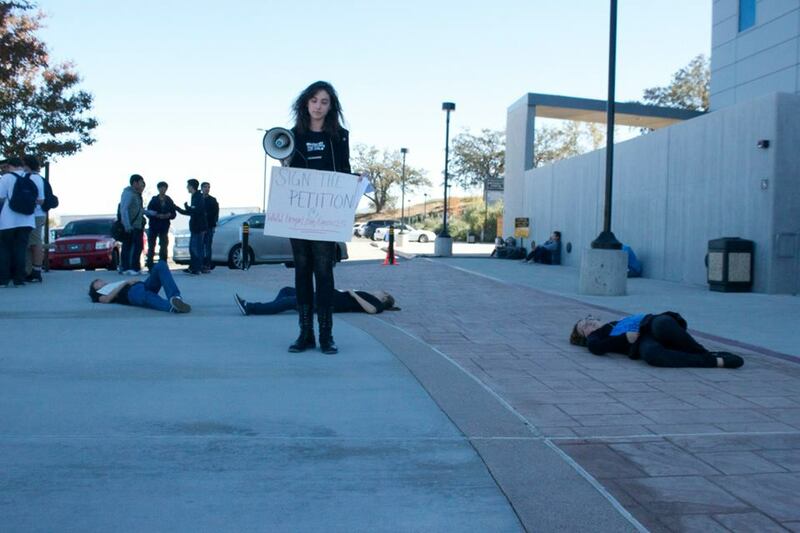 The “die-ins” generated interest in the CRC and asked students to take action in support of US ratification. Students completed the on-line CRC petition and called the White House to ask President Obama to support the CRC by sending it to the Senate for review. 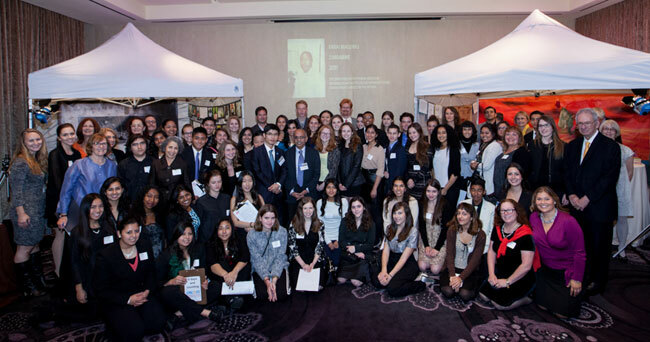 November 11, 2014: STF students and teachers joined over 700 other dinner guests to honor human rights defenders and celebrate the dedication of Human Rights Watch’s longtime supporter, Sid Sheinberg. 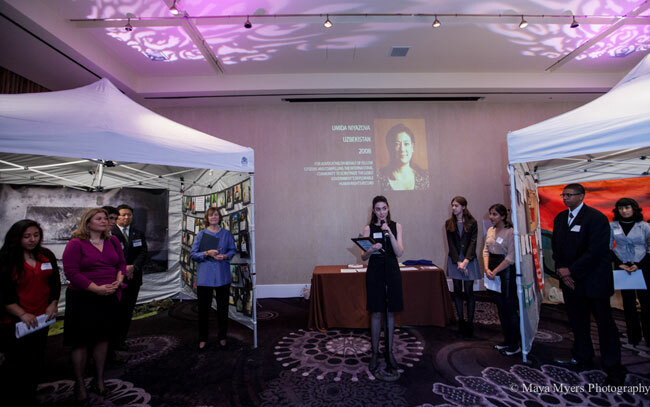 STF contributed to the evening by hosting a preview of the traveling Children’s Rights Camp during the reception for the annual HRW Voices for Justice Dinner. 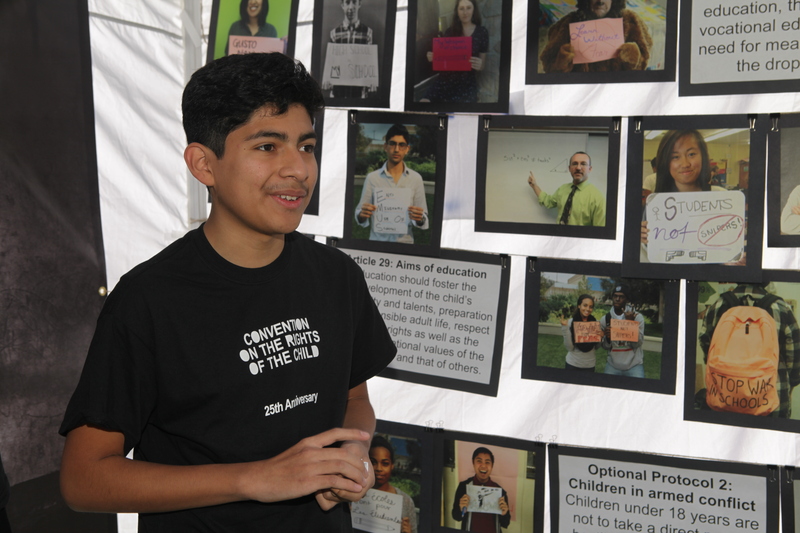 STF invited the honorees and dinner guests to visit the traveling Children’s Rights Camp and to contact President Obama and urge U.S. ratification of the Convention on the Rights of the Child. 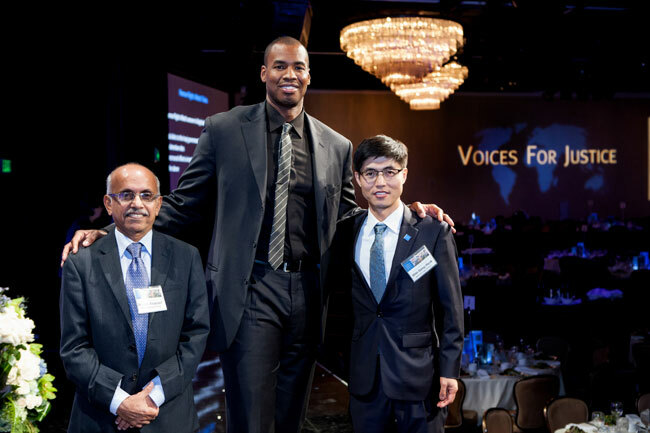 After dinner, emcee and NBA star Jason Collins walked through the Camp and congratulated STFers on their efforts, encouraging them to continue to be the voices for children everywhere. 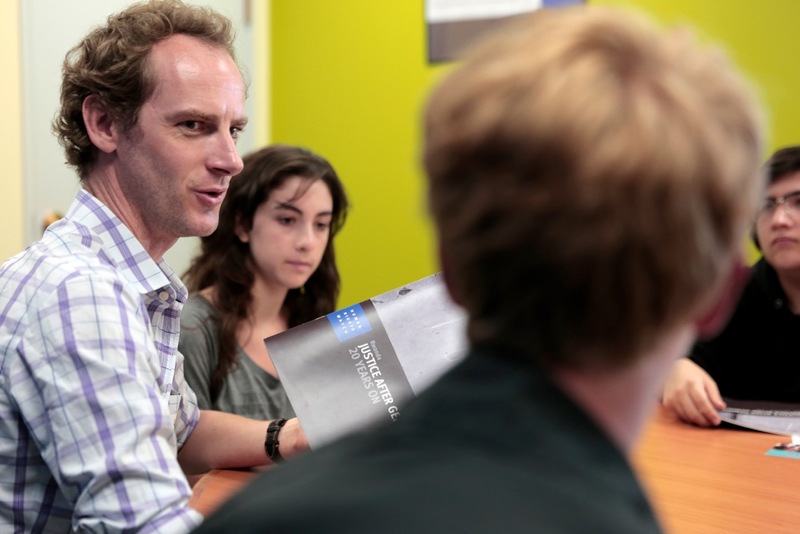 Lewis Mudge discusses what life as a HRW researcher is like in Africa. Photo by Patricia Williams. 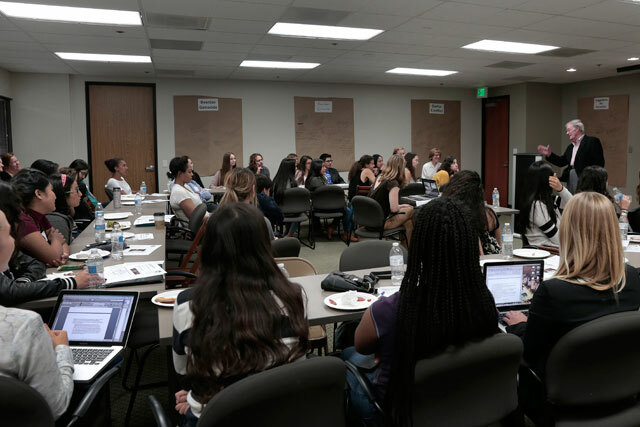 September 22, 2014: Lewis Mudge, HRW Researcher on Rwanda, Burundi and Central African Republic, met with current STFers and alumni to discuss life in Africa and what it is like being a HRW researcher. 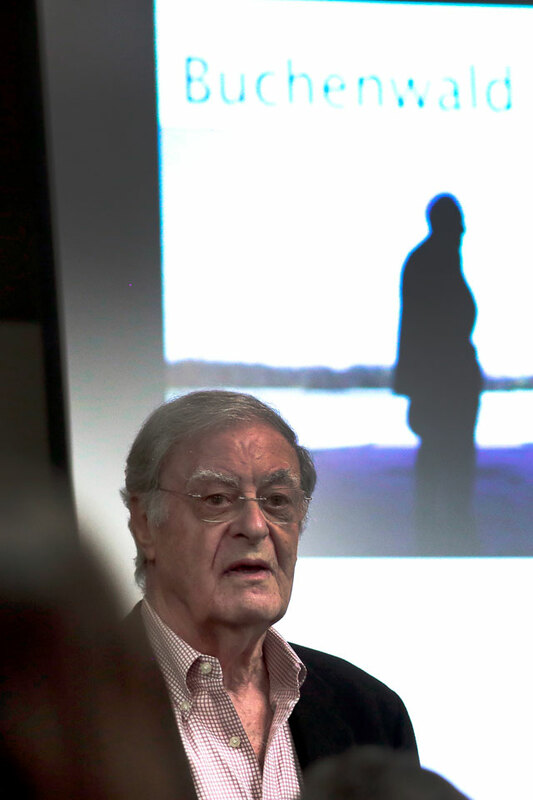 After discussing Lewis’s path to HRW, the group focused on his role in documenting the violence in the Central African Republic and political disappearances in Rwanda. 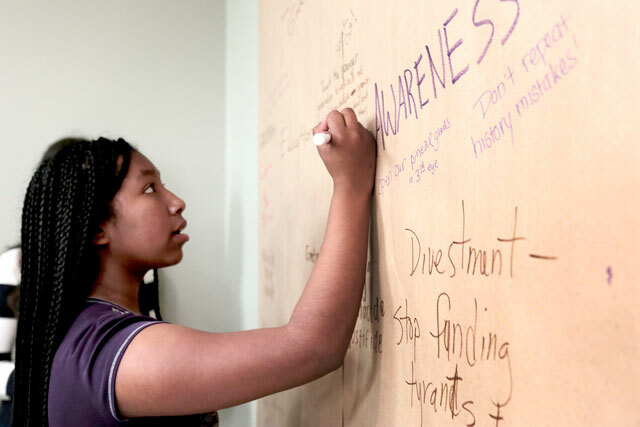 Students asked pointed questions to help them develop ideas for their spring efforts to raise awareness about genocide. “The number one country HRW writes about is the United States. 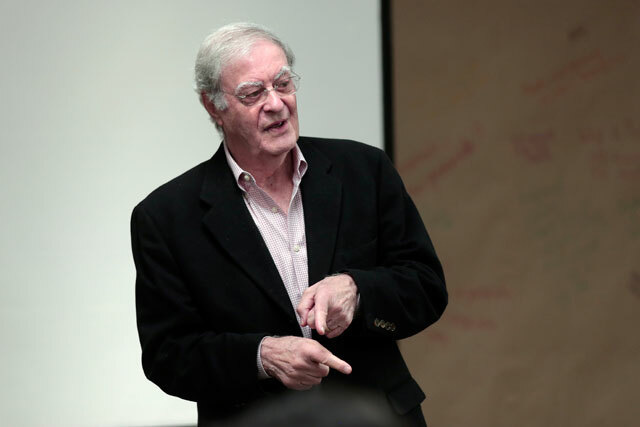 If you are interested in what is done in the US, dive into it, start researching issues and just try to get there in person,” Lewis advised when asked how to become a Human Rights Watch researcher. Read minutes from the meeting! Watch part of the discussion! 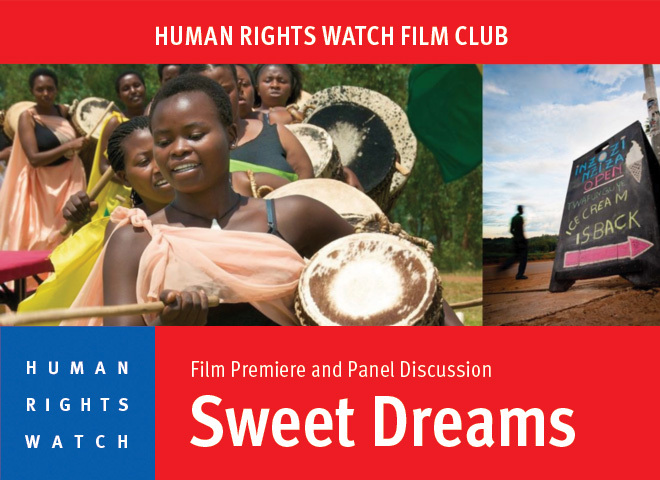 Twenty years after the Rwandan genocide, the powerful documentary, Sweet Dreams captures the uplifting story of a group of Hutu and Tutsi women who form Rwanda’s first all-women drumming troupe and open its first ice cream shop. Sweet Dreams explores the aftermath of the 1994 genocide through women’s empowerment and the entrepreneurial spirit of today’s Rwanda. It depicts the remarkable story of Ingoma Nshya, a drumming troupe, as they bring together women from both sides of the conflict, to build a place of support, healing and reconciliation and introduce a brand new business, Rwanda’s first ever ice cream shop. 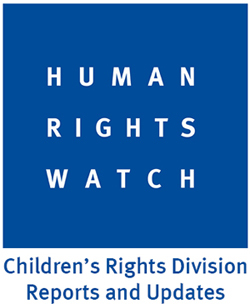 Human Rights Watch has documented the genocide and continues to report on human rights abuses in Rwanda. 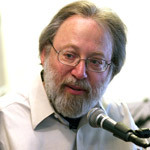 Join us after for a discussion moderated by Los Angeles Times Film Critic Kenneth Turan, with Director Lisa Fruchtman and Human Rights Watch Africa Researcher Lewis Mudge. 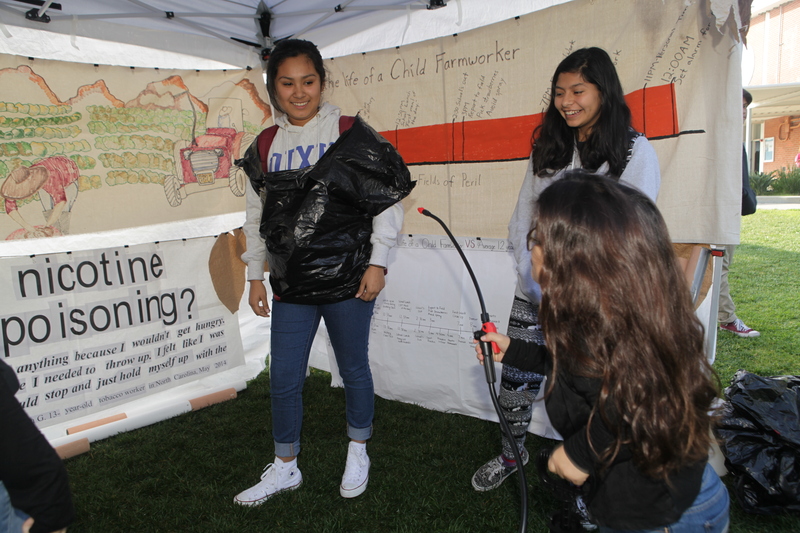 STFers set up the first tents for the Children’s Rights Camp at the 2014 Fall Leadership Workshop. 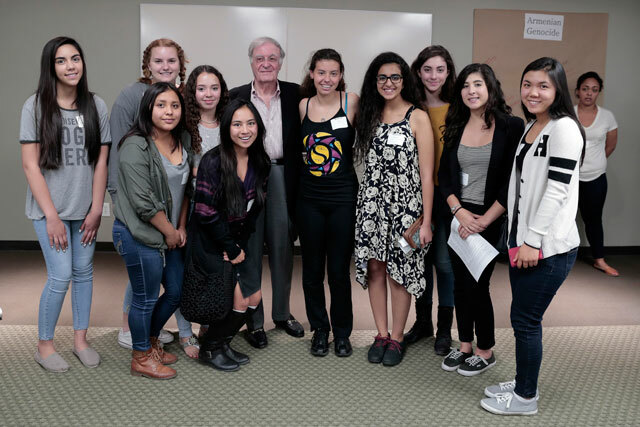 September 6, 2014: With the help of 60 students, teachers and friends, STF kicked off the 2014-2015 Traveling Children’s Rights Camp during the Fall Leadership Workshop at Wildwood School. 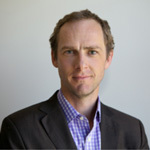 Bede Sheppard, Deputy Director of the HRW Children’s Rights Division, joined participants via Skype from Jerusalem to discuss the growing international attention for EMUS. 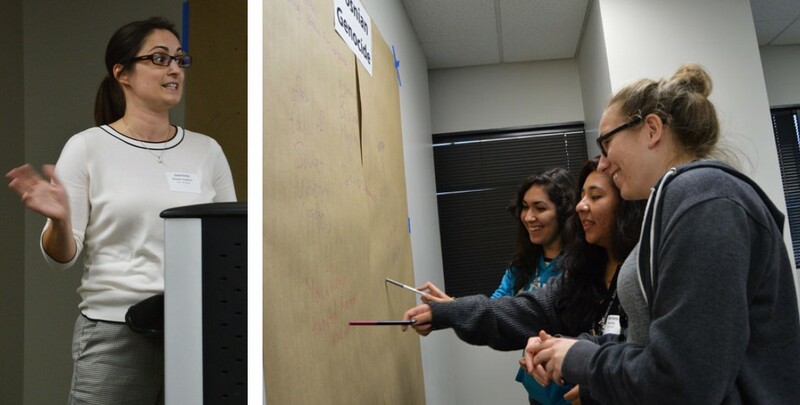 Students began planning for the Traveling Children’s Rights Camp, brainstorming ways to transform the tents into advocates for: US Ratification of the Convention on the Rights of the Child, EMUS, Juvenile Justice, Child Migrants, Child Tobacco Farmworkers and the Right to Education. 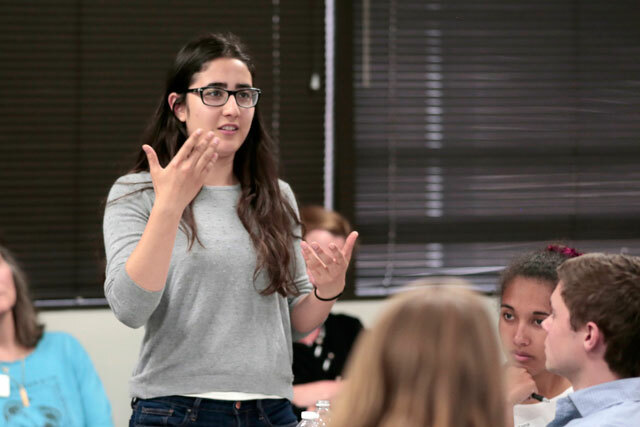 In the coming weeks, STFers will develop materials to share across campuses and educate their communities about how to protect children’s rights. 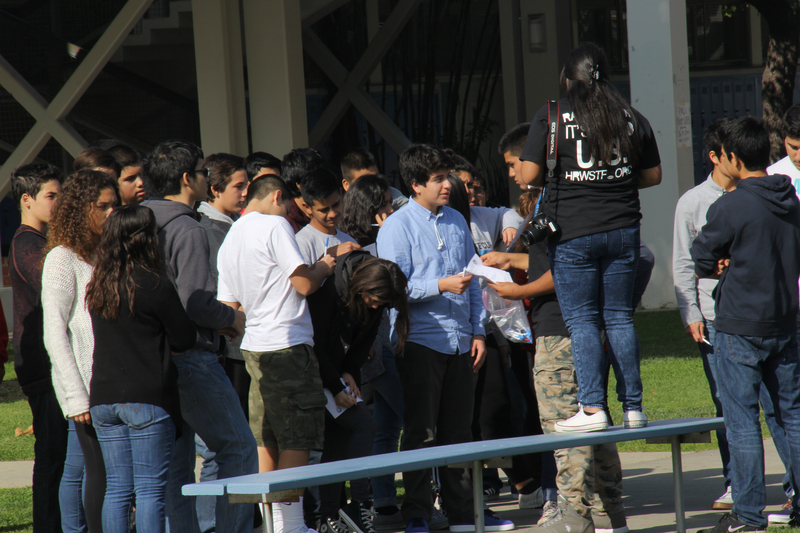 The leadership workshop was generously co-sponsored by the Wildwood School. Thank you to all who were able to attend the workshop. 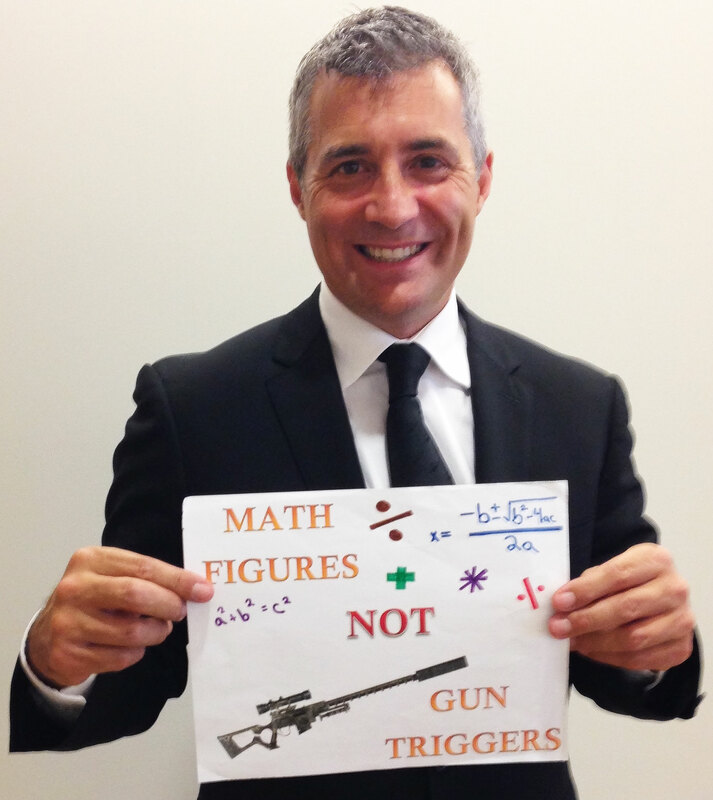 We look forward to working with you and your growing STF chapters. August 20, 2014: While many of us were vacationing, STF student delegations met with representatives from Finland, New Zealand, the Philippines and Australia to raise awareness of and support for the EMUS Campaign. 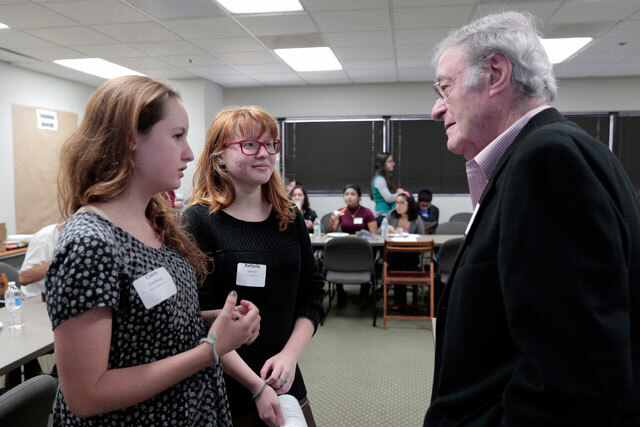 Students from New Roads, Oakwood, Palisades Charter, Santa Monica and Sierra Canyon schools asked Consul Generals to encourage their governments to step up as regional leaders and promote the process to finalize the Draft Lucens Guidelines. 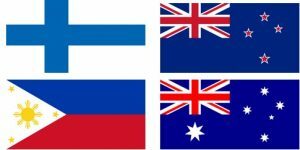 Consul Generals offered to send letters on behalf of STF to their Ministries of Defense and to their Ambassadors to the United Nations in Geneva and Norway, as well as to representatives of the UN Conference on Small Island Developing States. 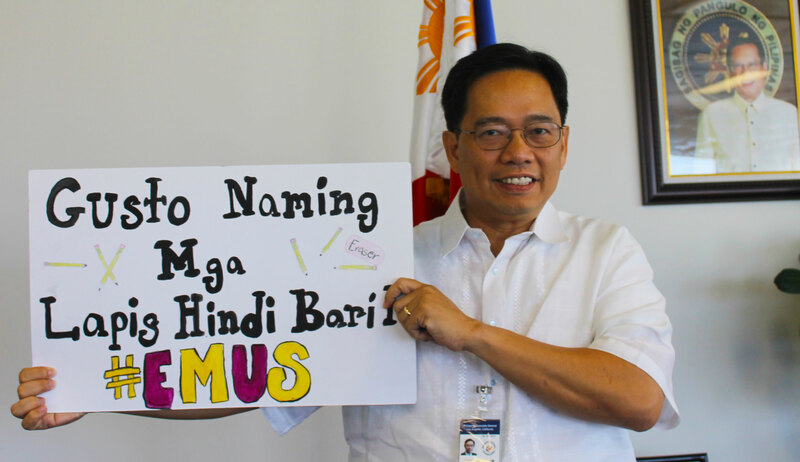 Two consulates also promised to share information about EMUS on their social media websites, which will help bring attention to the issue at home. Mexico, New Zealand and the Philippines took EMUS photos which are now officially posted to emuscampaign.org. 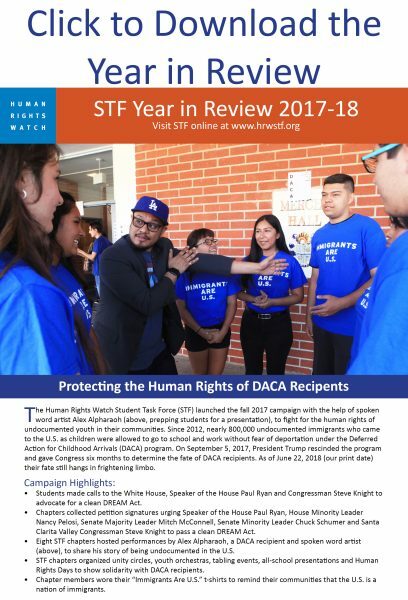 Congratulations STF for such a productive summer! More meetings with consul generals are in the works. Welcome back STF class of 2014-2015! 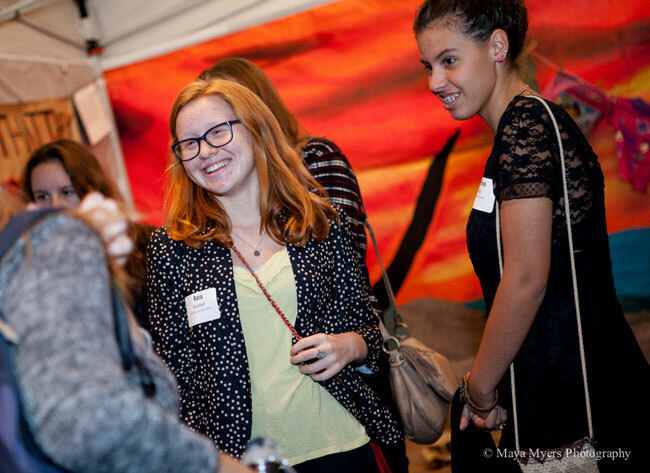 As you prepare to head back to school we invite you to one of our most important events of the year: STF Fall Leadership Workshop! More information coming soon. Mark your calendars and RSVP today! If you have any questions, or would like to volunteer to help organize the workshop, please contact Kristin Ghazarians. 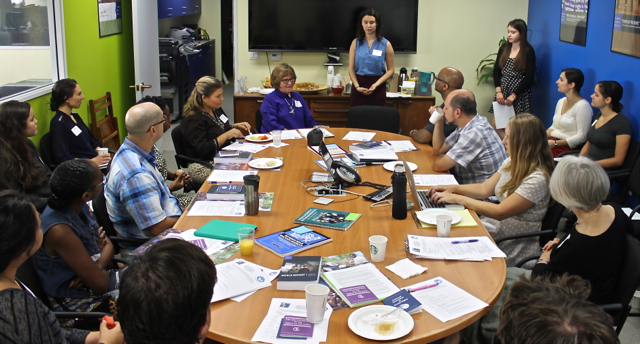 August 2, 2014: At the third HRE USA Southern California Regional HRE Gathering, 20 educators, students and community members met at the Human Rights Watch Los Angeles office to establish a local Human Rights Education (HRE) collaborative community. 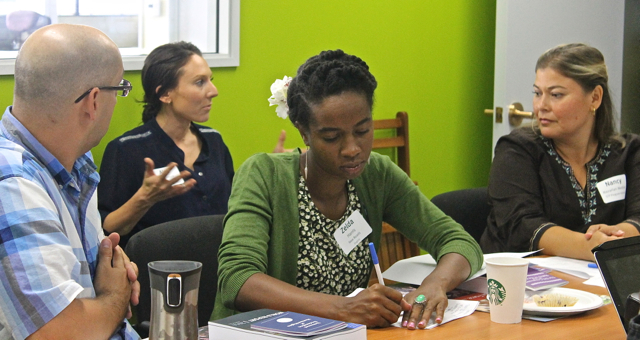 Participants shared human rights resources, curricula, and methods, and discussed how to create opportunities to observe HRE best practices in all subject areas. 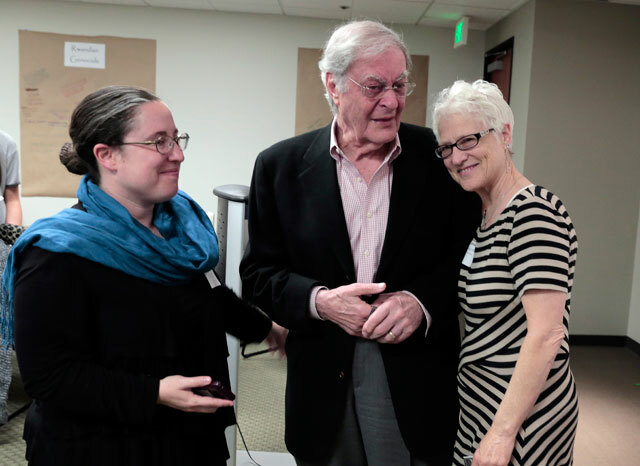 The group was joined by special guests Nancy Flowers and Bill Fernekes. 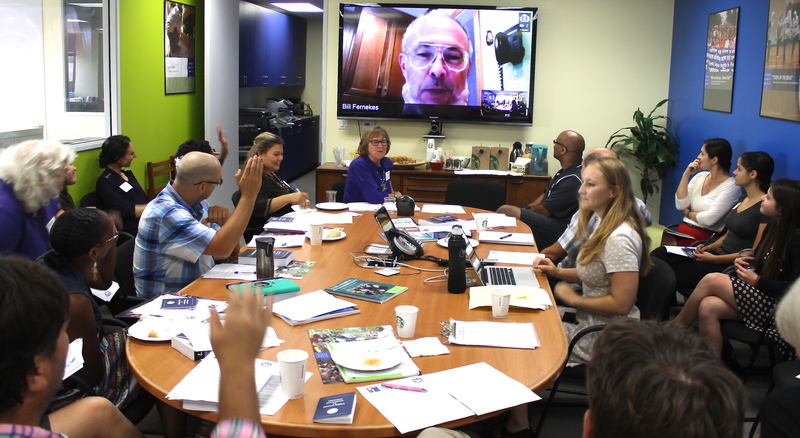 Via video conference, Bill Fernekes inspired participants with his work creating a guide on how to help teachers integrate HRE on a daily basis in the classroom. Though his efforts focus on social studies instruction in New Jersey, the integration guide will hep identify HRE entry points across curricula. 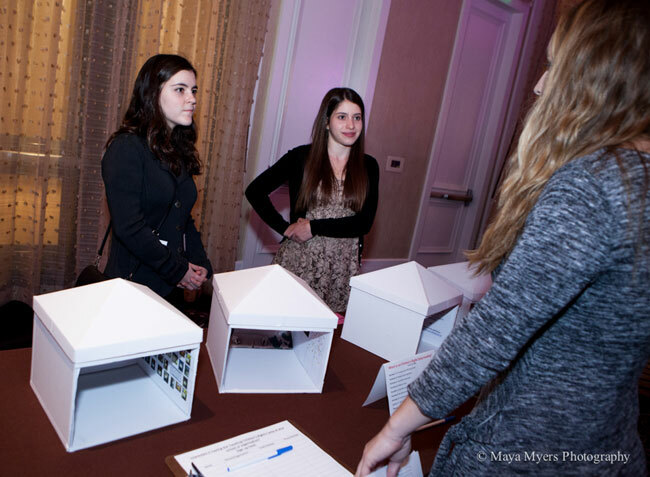 Several teachers and students offered to test materials in their own classes. 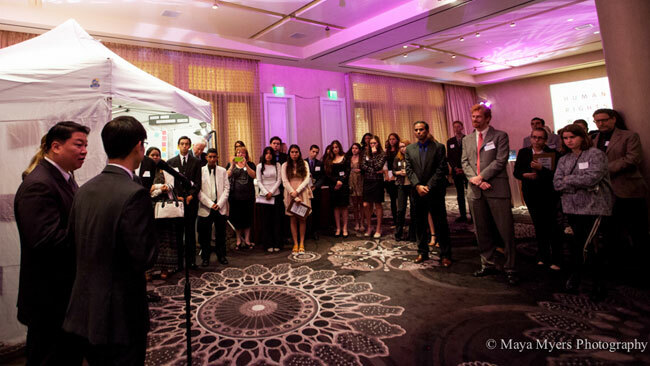 STF appreciates the support of Mexican Consul General. Photo by Kristin Ghazarians. 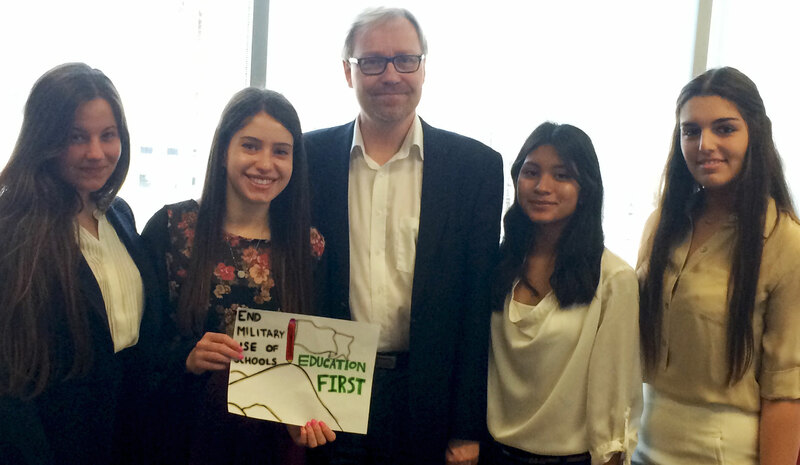 June 23, 2014: In February, Mexican Consul General Carlos M. Sada learned about the End Military Use of Schools (EMUS) Campaign during a community presentation by STF Co-President Karina Duarte at Palisades Charter High School. He welcomed a follow-up meeting with STF. 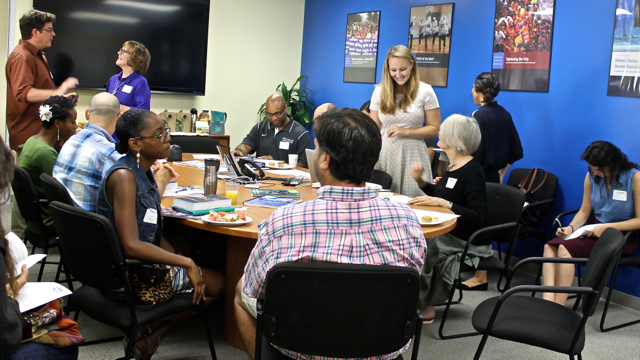 On June 23, representatives from Academy of the Canyons, Canyon, Golden Valley, New Roads, Oakwood, Palisades Charter and Santa Monica high schools met with Sr. Sada and reviewed EMUS. 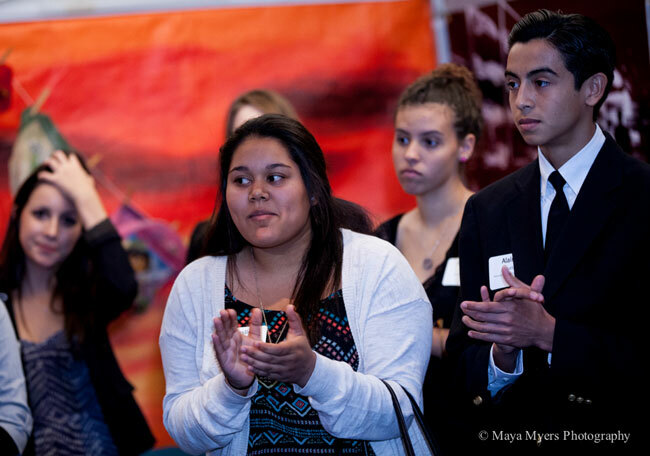 The Consul General suggested ways Mexico and the Student Task Force could work together on the campaign. Consul General Sada said he was very impressed with this student movement at a time when many governments, and society in general, pay little attention to issues of children’s rights. 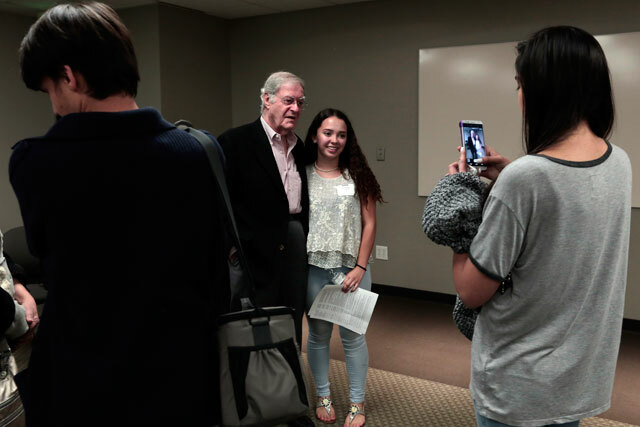 He acknowledged the importance of STF’s work in raising awareness about this issue. 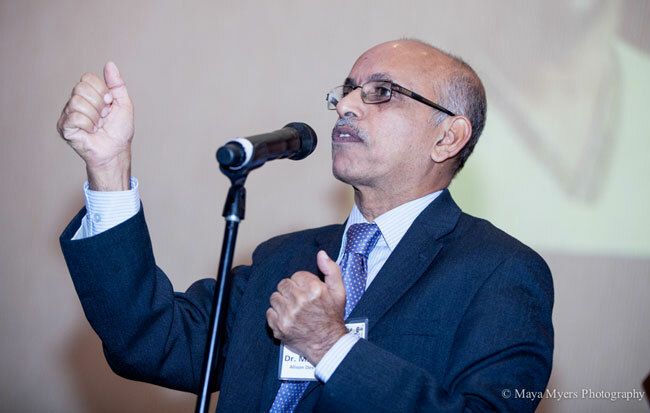 He offered to arrange an invitation for STF to discuss EMUS with his fellow Latin American consul generals at their next regional meeting and asked for more information about the meeting to finalize the Draft Lucens Guidelines in Norway this fall. Most importantly, Consul General Sada offered to meet again with STF to continue the discussion of the right to education and children’s human rights.